Finally someone comes to unlock the gate and I ask in all my American naivety, “Have we missed the party?” I over enunciate “missed” making sure to add the “d” on the end. Americans tend to speak lazy English and despite the influx of American entertainment, it can make us difficult to understand. That, and we sound straight up ignorant to English speakers elsewhere. Don’t ever let anyone tell you South Africans don’t have money. I’m from the ‘burbs, a so-called affluent one at that. And the Black wealth in this city is unlike anything I’ve ever seen. We walk down a pathway on the estate to the backyard, which is the size of a half a football field. The pool, to me, looks Olympic sized. There’s a full-fledged braai going on. Everyone is what we would call in the States “white boy wasted.” Here’s the thing about Johannanesburg though. What we call wasted is what they call getting started. I can drink. I can hold light liquor, including shots, with the best of 'em. No stumbles, no slurs, definitely no falls. I can’t hang in Joburg. Everyone’s just real extra, celebrating the new year. Some guy—someone’s husband—is running around with a bottle of Goldschlager convincing everyone to take bottle shots, which plenty of people consent to. He seems put off when I decline, and insists I drink something. It’s just uncivilized not to have a drink in my hand, so I accept a barely red glass of Goose and cranberry. There’s another girl, who I have to assume is drunk because she’s so obnoxious, but she ain’t wobbled or slurred once. She’s a close talker, treating everyone she meets like they’re her best friend and declaring, “you’re my new best friend!” to Thuli. I rescue her by asking her to grab something to eat with me from the table. Noshing on carbs is when I discover that Thuli is Zulu, and that’s when I make the connection between South African Zulu and New Orleans Zulu Social Aid and Pleasure Club. I went to my first Mardi Gras last year, and hence my first Zulu ball—30k black people in tuxes (with tails) and gowns packed into the convention center. I’ve never seen anything like it. Somehow in my stupor I recall that my great-aunt, born and raised in New Orleans, calls her mother “Go-Go” allegedly because she’s always on the move, and realize it’s the Zulu word for “granny”. I wonder if this is coincidence or some cross-cultural-continental connection. But I don’t say that. I just ask Thuli if she’s ever heard of New Orleans Zulu balls. “I’m sorry what?” she says. She’s never heard of such a thing. I try to explain to her, in my very limited understanding of New Orleans culture, what the Zulu ball is and the parade, which is a wondorous and fascinating experience if ever there was one. I do well enough to convince her to come to the States for 2014 Mardi Gras to see it for herself. The party was winding down when we arrived, and quickly does further while we’re there. After an hour, it’s cleared out and we’re down to the actual friends of the hosts, not just the people who showed up for the revelry. We’ve retired to I guess what would be called the basement. It’s got a bar the size of any TGI Friday’s and stocked just as well. It’s “only” 3 AM and everyone’s trying to figure out where to go next. “There’s a party going on at Leroy’s,” Nandi, another friend, suggests. And just like that it’s decided. Off to Leroy’s we go. So here’s the thing. You tell me we’re going to a party at "Leroy’s", I’m thinking “Oh, Black guy.” I’m expecting a Brooklyn-type houseparty—sweaty black bodies., full of smoke, all of us packed in someone’s basement. I’m so down. But that ain’t what we walked—better, drove into. We pull up to the house and there’s no cars. Party done? Not quite. Leroy lives on estate, too, a bigger one. We pull up to the gate and someone opens it for us to pull in to park inside. The lawn is littered with BMWs and Audis. Leroy’s house isn’t a house, it’s palacial. And "Leroy" isn’t Black. He’s a well-perserved Italian guy in his late 40s or early 50s. This is a private party. Maybe 14 people. The DJs white, his lady is white, and Leroy is white. Everybody else is Black. I don’t get it. Harpo, why this middle-aged white man got all these Black “friends?" It’s funny. Harmless enough. But I have the sneaking suspicion something ain’t right. Leroy is beyond a gracious host. There’s empty bottles of Moet littering the counter. On the island, there’s gobs of food, and while I’m fixing a plate of veggies, Leroy pulls a fresh roasted chicken from the oven and starts dispensing meat on to everyone's plate like it’s Thanksgiving turkey. Leroy wants to know what I’m drinking. I scan the remaining bottles—all hard—and decline. I’ve been drinking since 10. I can’t drink like a South African or I will throw up. “Champagne? You want champagne?” Leroy asks. He opens the fridge and it’s stocked with champers like a new money rapper on MTV Cribs. So yeah, I take him up on the offer. Nothing really eventful happens between the hours of 3AM and 6AM. The DJ is spinning in the living room, people are chilling and dancing and chain smoking on the patio. I don’t really dance anymore, but when Leroy approaches me at 5AM in the middle of a Biggie set, I give him a two-step out of obligation to the host. I can’t just drink up the man’s top shelf liquor and not give him a wiggle. Shortly after that he disappears—to bed?—and the party keeps going. Around 6, when the sun is coming up the DJ complains that they party is going a little long. He’s from Atlanta and used to a late night ending at 4AM, not whenever this is ending, which even now shows no signs of stopping. He needs a break. Everyone seems to be having a good time, and me being the American guest, I think of all of them as my hosts. I decide to relieve the DJ. Mind you, I've never spun a day in my life. I get in the DJ "booth", the actual DJ shows me the basics, supervises me as I cue up my first song and transition to the second, then plops in a chair nearby to for a catnap. 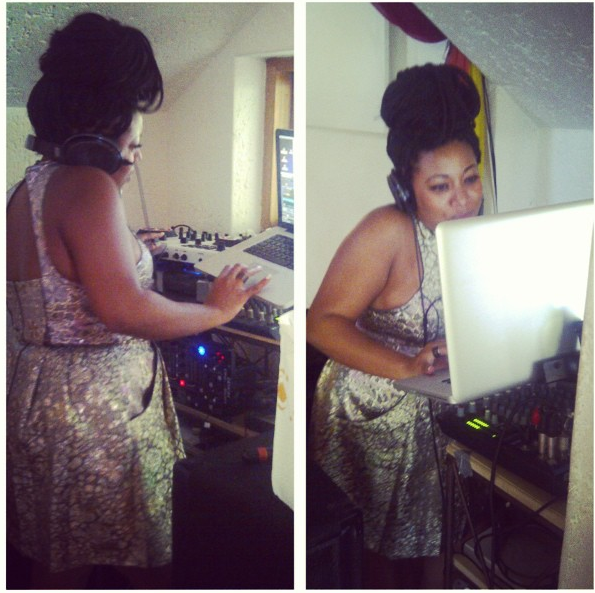 Just like that, I’m DJ Belle Belle. I actually do all right. I start with —surprise—a Kanye set, and people, scattered all over the hosue by now, come back to the living room to dance. After the first four songs, I gain a new respect for DJs. I actually like this, but it's singlehandedly the most aggravating thing I have ever tried to do. The pressure of reading the "crowd", queing up the next song, searching thru a song list, and al on a short timeline is intense. When a song gets down to the last 30 seconds, my screen flashes an annoying red light. Pressure. Pressure. I’ve been to enough parties to know that whatever I do, I can’t let the music stop. Picking a bad song or a song that has no similar beat to the previous one is better than silence. It’s not that I don’t have a swimsuit. Undies and someone’s t-shirt would suffice. It’s also 7AM, ie, bright light, not a midnight swim. It is because these are strange, although very nice men. There’s no explaining this one to CBW who I’ve just BBMd to wish a Happy New Year on East Coast time. I'd have said "fiance" but "hubs" carries more weight in these situations. “Oh, is he here?” the guy asks. I laugh because the game doesn’t change, even on other continents. And no, I don't get in the pool.